La-La Land Crafts Inspiration and Tutorial Blog: Sugar & Spice and Everything Nice! Hey everyone, Jana here! 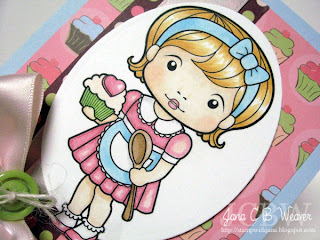 Sugar and Spice Marci is just adorable...I think she's my favorite Marci right now! Today I finally put some color on her - and I like it! I pulled the color from this fun cupcake paper I had in my stash. 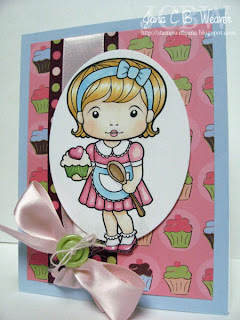 The layout is this week's Sweet Sunday Sketch from Karen Giron...I just added a buttony bow to complete it! Now, if you're headed to L.A. to CHA, don't forget to swing by booth # 4607 and give a big hi to my peeps down there. Love this color palette and how everything came together Jana! So adorable and love the coloring!! Love this Jana =) Pretty colors and love the layout! Great job. Sugar and Spice and everything Groovy...that is the song I thought of when I saw the title of your post! lol (not sure if you know who the Archies are or not) This is an adorable card! 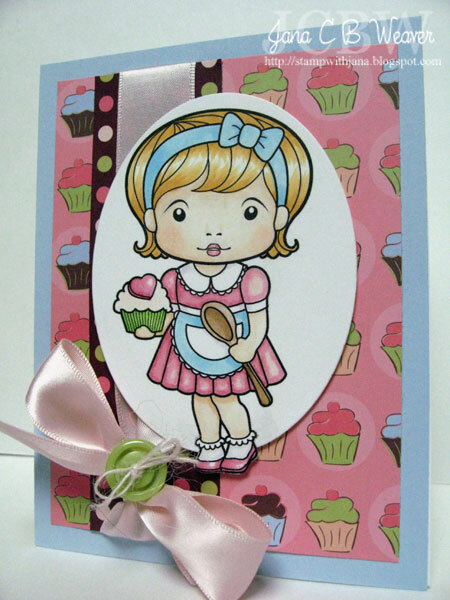 I just love this Maci and that cupcake paper is delish!